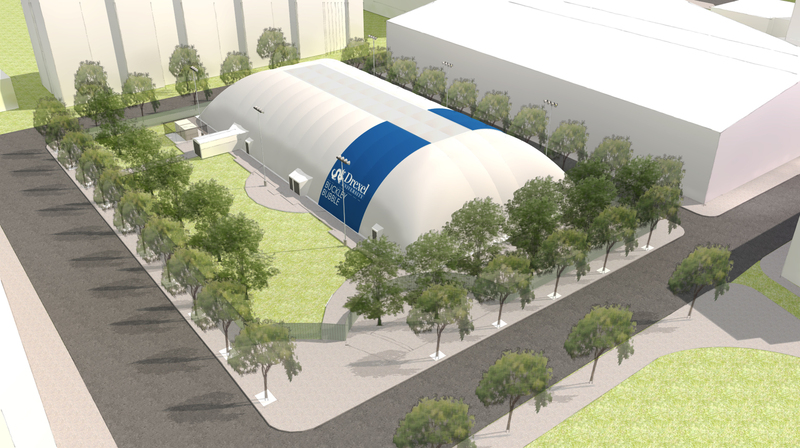 As construction of the Armory unfolds its transformation into a national squash training center, yet another construction project is beginning: the installation of two domed structures on campus to become the new hub of athletic activity. To accommodate the lost space within the Armory, the two-bubble solution was put forward to provide improved sports programming by installing two seasonal air-structures at Buckley Recreational Field and over three tennis courts at Vidas Athletics Complex, according to director of athletics Eric Zillmer. “The two-bubble proposal for relocating sports out of the Armory provides a modern and appropriate solution for Drexel Athletics and Drexel University,” Zillmer said. While the groundwork for the Buckley bubble is already currently underway and will be inflated and available for use in the fall of 2019, its twin at Vidas will likely be completed in 2020. Both bubbles, however, will significantly enhance athletics, according to Zillmer. Offering a combined space of 44,572 square feet, the bubble solution surpasses the former usable space of the armory, which was about 30,000 square feet. This 30 percent increase, he said, opens new doors for open recreation, intramural, club and varsity sports. And this space also offers a more suitable sports environment singularly appropriate for an urban campus like Drexel, he said. In addition to boasting better lighting and playing surfaces, the bubbles will also have the capacity for heating during the winter months, unlike the armory. “The sports-specific bubbles will provide better athletic environments for our students to play sports than did the Armory,” he said. This increased space alongside better athletic conditions will ultimately result in additional sports programming, he explained. Most notably, he said, the construction of the bubble over the Buckley Field will allow for intramural soccer — one of the university’s most popular intramural sports — to be played across all four terms of the year. However, he said that a wide variety of other sports will also greatly benefit from the bubbles, including club baseball, softball, cricket, soccer, quidditch, ultimate frisbee, lacrosse and rugby. “The increased programming for Drexel recreation is a significant factor and the biggest advantage of the two-bubble solution,” he said. Students can also take advantage of the new training center as well, he said. The development of the bubbles signifies the growing number of students who want to be part of Drexel’s sports environment, he said. Noting reports done by Drexel’s institutional research team, he explained how about 85 percent of full-time freshmen use the DAC and that students who visit the University’s Recreation Center 10 or more times a year have a 10 percent higher retention rate and significantly higher GPAs than the student body average. “I am personally most proud how sports are playing an increasingly visible and important role in the perception of and the life in our University. The new bubbles will only add to this trend,” he said. But he said that not just student athletes will profit from these changes, as the bubbles will even function as venues for numerous student organization events. Recreational Athletics formerly hosted an array of events in the Armory, as well as in the DAC, but he said that these can be difficult to accommodate with limited space. However, having bubbles over Buckley and Vidas will now allow for additional areas to host these student organization events. All students, he said, can also be excited for the mere sociability of such an endeavor since recreational athletics have truly become the social nexus of college campuses. And the overall impact extends beyond the Drexel community, he said. Though losing the Armory is an unwelcome change for some students, overall, he said he thinks that everyone will realize that it’s worth it once the bubbles are ready for use. “Of course nobody wants change, but the Armory was never conceptualized to be a rec center,” he said. He explained how Drexel was merely leasing the space, knowing that it wouldn’t always be in their terrain, but since the bubbles are on actual Drexel property, Drexel athletics has full control over their programming and hours. And with this, he said, there will be no looking back.